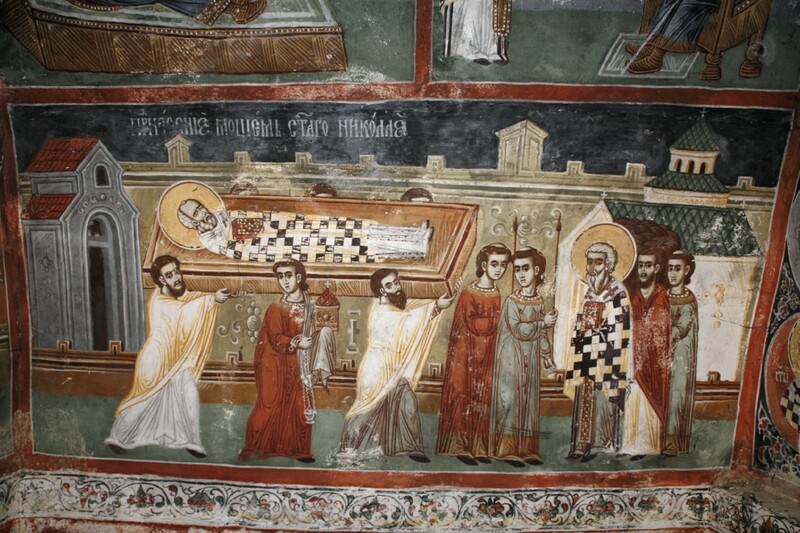 (2) Disembarking, then, at Myra, these privileged mariners, after approaching the sacred and holy grave of the Blessed, and after bowing down with great humility, as was meet, they made an act of reverence. Then, after they found monks watching beside the holy grave of the Blessed, they requested them to make known to them where the saint's body lay. The monks, thinking that they had made the request in order to reverence the body, with sincerity and kindheartedness complied with their desire and showed them the place where the body of the holy prelate was. The monks afterwards questioned them somewhat sharply "Why you men, do you make such a request? You haven't planned to carry off the remains of the holy saint from here? You don't intend to remove it to your own region? If that is your purpose, then let it be clearly known to you that you parley with unyielding men, even if it mean our death. For we have rid ourselves of all fear. We won't allow this to be done, we are not going to take after the Iscariot who became a traitor to his own Saviour and Master. Away with any such thoughts! But in truth how can we be unthinking traitors to our own guardian, to our protector, our champion, our intercessor? How can we show ourselves as not submissive, but disobedient servants of our benefactor, our patron and our father?" (3) They then who made their request humbly enough as reasonable men, made reply to the monks in humility: "Why surely indeed we admit to you that for no other purpose did we disembark here than to take the holy remains of our inspired Father. We beg you, then, for your acquiescence, to be our helpers in this, and let not our efforts be in vain." And the monks replied: "The saint truly will not allow this to come to pass, and he will not consent to have his body touched. But if you would listen to our advice, make off from these parts with all speed, before the townspeople hear of what is going on and put you to death." The men that made this request, then, seeing that they had answered in bitterness of heart, changed their tactics accordingly as it is written elsewhere: "The best course to be pursued is the one that is the least obnoxious", and they said: "Look you, that we have not disembarked here of our own will, but we have been sent by the Pope of Rome and by the Archbishops and Bishops and authorities at Rome associated with him and the whole Council. For all of these arrived in our city of Bari with a large host and the diverse armies of the west, enjoining on us to accomplish this work, and bring back to the Pope the remains of the saint without fail. Why even the saint himself, appearing in a vision to the Pope bade him do this with all haste. And you if you want, accept suitable recompense from us, that we may depart in peace and benevolence." (4) After saying this to the monks, when they saw that these persisted the more in grief and tears and regarded their words as of no account, they forced their way into the miraculous tomb. The watchers seeing this unexpected turn of events and overcome with fear and trembling, rent their garments and pulled at their hair and beards, bewailing their misfortune piteously, and made as if to inform the citizens of the happening. 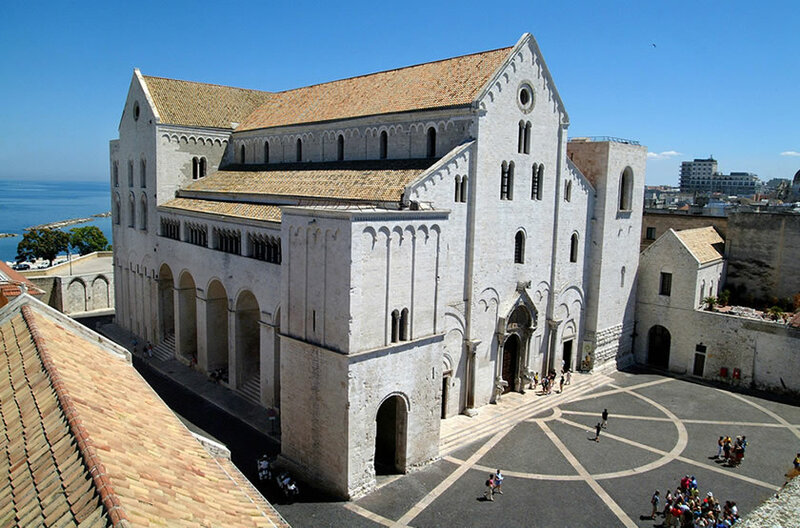 And when the men of Bari perceived-this, they put guards at the entrances and exits of the holy church and, overpowering the monks, took counsel how they could open the holy tomb of the Blessed. And one of them whose name was Lupus, a priest holding a glass vial filled with the prelate's sacred oils, when he saw that his comrades were in distress, let it fall from his hands and heard it crash upon the stones; and he and his companions turned toward the vial and discovered it to be intact. Wherefore they offered fitting praises to God and to His servant and acknowledged with full accord that the will of God and of the saint acquiesced in the removal of his remains from there, For the visitors now had full assurance that the saint was escorting them, and saying: "Here is the tomb in which I lie; take me then, and depart; for the people of Bari are to be forever protected by my intercession." (5) One of them, whose name was Matthew, carried away with desire and devotion, and bent on carrying off the sacred remains of the Blessed, rushed upon one of the monks with a sword, saying: "Either show us whether this is the venerable tomb of the saint for whose sake we have come, or I shall dispatch you with my sword", and he seized him with his hand and brandished his sword before him. And one of the monks made answer to Matthew: "' Why my child, do you assail your brother unjustly'? 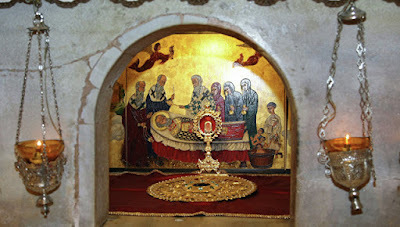 Be assured, then, that this is the sacred and venerable tomb of the Blessed from which the sacred oil wells up. Many kings and potentates, too, especially the rich, have attempted to do this and have been desirous of carrying off the remains of the saint; but they were not able, for God and the saint did not allow them. But now, however, I am much afraid that the words of learning pronounced by our holy Father are now indeed about to be fulfilled in you, when he said that he would be carried off to a foreign land and well apart from us." And the men of Bari, hearing this, questioned the monk with all diligence. "How might you tell us of this vision?". And the monk answered: "A year ago, my brothers, our loyal patron appeared in a vision to three of his servants of the monastery and bade them to announce to the citizens who through fear of the Persians had fled twelve stadia into the mountains, to return and dwell in Myra. And if they do not, in very truth I shall depart into a foreign land. And as he predicted, so has it now come to pass, Wherefore, sheathe your naked swords and have done with all strife among us and let there be an end of harsh threats. And if it has been granted to you to remove the venerable remains of the saint, go on your way in peace, with all good-will and resignation from us. For we shall stand condemned, if we do not obey the injunctions of our holy Father. But we trust, God willing, that he will not allow us, his servants, to remain entirely bereft." (6) The aforesaid Matthew with his companions, convinced by these words, put down his sword, and, taking up a huge mallet, hammered with great force at the cover of the floor, which was over the oil-exuding tomb, and straightway shattered it. And digging into the hole, led on by the welling favor of the sacred oil, they discovered a second cover which was the lid on top of the splendid chest. When s they had opened this but half way, fearing to shatter it lest perchance they be turned to stone, the aforementioned Matthew, unable to restrain the ardor of his heart, having no care for himself lest he suffer any harm, beat upon the cover with great strength and shattered it to dust. And when they had opened it, they saw the glory of God, for they found it filled with sacred oil, in the presence of Grimaldus and Lupus the priests of the merchant ships and some of the sailors. And immediately such an odor was wafted up to them that they seemed to be standing in Paradise. And not to them alone was the odor vouchsafed, but it pervaded even to the harbor to those in the ships. Immediately then, illuminated by the perfumes they recognized that it was unquestionably within their power to carry off the remains of the saint. After this, Matthew, putting aside all fear from his heart, fully clothed as he was, descended into the sacred and holy tomb. And while he was descending within, and dipping his hands into the sacred oil, he beheld the venerable remains glowing like coals of fire, fragrant above all fragrance. And taking them in his hand he kissed them and caressed them endlessly. And he handed them over to the two aforementioned priests. From these portents it was clear to see that Bishop of Christ was bestowing himself on the Italians. (7) The monks who were on watch, when they saw what had happened, began to wail aloud and cry: "He and he alone was our Father up to now, and never did he allow anyone to do such things. O how great and inconsolable an affliction has overtaken us!" And turning to the saint, they wailed in lamentation and spoke: "Our Lord and most holy father, why are you leaving us orphaned of your protection in such distress and necessity, and have become well disposed to strangers and wayfarers, while to us your servants from our earliest youth, you have shown yourself unhearing and unpitying? Is it true that you have reckoned as nothing the ministrations of our fathers and of ourselves, and instead of our being under the protection of your venerable glory, are you withdrawing from us such intercessions and favors? Alas for our life, in what darkness you are leaving us and the See of Lycia! Alas, why did you not allow us to be given to death, rather than be separated from you! Our benign Father, thou have become embittered, and, as we see, you have made of thy beloved sons objects of hate. Alas for our possession! How we shall lament when we see our children and all our goods rendered nought from henceforth! To whom shall we flee? Who will render us justice from our enemies? Who will stand patron over our souls?" (8) At this juncture, Matthew, taking up the sacred remains, held them carefully. One of the two priests, Grimaldus by name, taking them as they were and placing them in his cloak, took possession of them with clear conscience. But his fellow sailors, wishing to carry off a certain sacred and pleasing icon which was very old and depicted this most reverend and holy Father, were unable to accomplish this, in order that they might not be ignorant of this also, that the servant of Christ in no wise wished to leave his sanctuary entirely without a share of his holy blessing. And when the men had been assembled and had taken up their arms, they, together with the priest bearing the sacred remains on his shoulders, repaired to their ships, praising the ineffable providence and benevolence and power of God. When those who were in the boats heard the great force of their hymn which they were singing to Christ the Saviour concerning this bishop, with inexpressible joy they accosted and received their fellow sailors, and adding their own praise to theirs, they lauded their Lord, the giver of crowns, who so crowned and glorified those who had placed their hope in him, and who, moreover, pronounced themselves unworthy to have attained to such a great and divine blessing. (9) Meanwhile, the inhabitants of the city learned of all that had happened from the monks who had been set free. Therefore they proceeded in a body, a multitude of men and women, to the wharves, all of them filled and heavy with affliction. And they wept for themselves and their children, that they had been left bereft of so great a blessing. Then they addressed the men of Bari: "Who are you and from what land, and have you dared to bring such a calamity upon our See? Whence has come such a conception and such an affront to us, that you have laid hands on our inspired Father who has been with us for so long a time, from the time of the great, Christ-­loving Emperor Constantine, who founded the capital city, so that from time until now no Emperor or overlord was able to do this? Truly our lord and Father Nicholas has thought you worthy of great gifts: of leaving us orphans and journeying forth with you." And unable to completely master their incumbent affliction, entering the sea, they cast themselves in, lamenting, taking hold of the rudders and oars of the ships. Then they added tears upon tears and wailing and unassuageable lamentation to their groans, saying: "Give us our patron and our champion, who with all consideration protected us from our enemies visible and invisible. And if we are entirely unworthy, do not leave us without a share, of at least some small portion of him." (10) While they were making lament in such and similar wise, immediately the men of Bari answered most kindly, saying: "Realize, brothers, that we are Christians, and that the saint appeared to us in a vision and bade us disembark here and carry away his venerable remains. And brethren, why do you stand frustrated and desolate over him? Behold, you yourselves have said, many generations have passed under the protection of the saint, and you and your fathers have possessed his healings and blessings. But now his will is to give light to the western world, departing from hence. 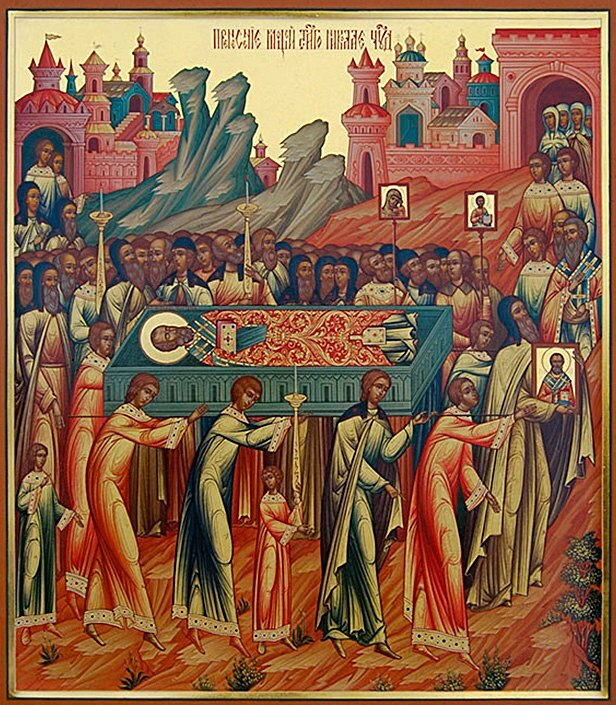 And now in place of these remains there is for you his venerable and all­-holy tomb whence wells forth the all­-holy oil, and likewise his venerable icon which works great wonders. For reasonably and justly does it happen that our preeminent city of Bari should possess so great a Father and protector". Thus did the men in the ships make answer to the people. But the citizens of Myra, seeing on board one of the monks of the sacred church, running around him with feeling, struck at him sharply, saying: "You have taken money to betray our protector and champion". (11) The men of Bari, then, having taken up the venerable and s holy remains of our blessed and inspired Father, placed them with great reverence in a very small wooden chest. Then at sunset, when a favorable breeze had arisen, upon a calm sea they set forth on their long voyage, and that night they drew nigh to a place called Caccabus (modern Kekowa). Then they arrived at Majesta (probably the island Meis). Then they went far out to sea and were hindered by adverse winds; in front of them lay the north as far as Patara, where the Blessed had received his birth. Having arrived at that city mid a great storm, they concluded that the saint did not want to journey with them and was not allowing them to sail further. Nevertheless, they forced their way twenty­-four miles further, and then, unable to advance more, having met up with a great calm, they sailed back to the harbor of Perdicca. When they had reached the shore they found the sea at rest, and the wind which had been adverse when they were sailing now favorable to them. And they said to one another: "See that none of us has wished to steal some part of the venerable relics, but let each one furnish scrupulously what he has taken." The sailors, moreover who had decided to bind themselves with fearful oaths not to keep any of the remains of the saint, immediately supplemented the word with deed. Each of them who had taken some of the sacred remains, made open confession and after having proffered and placed their portions with the rest of the remains, were proven clearly to have kept their oaths. 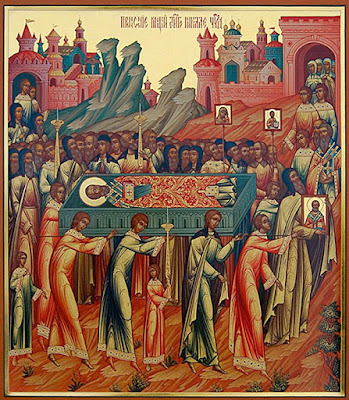 From such an event who would doubt that this was inspired by the Lord, who gave them courage, and would not fulfill their desires until they had laid the relics they had taken beside the rest? Thus it can be known that our saint and protector himself did not wish that any portion should ever be separated from his remains. O most wonderful and marvelous God who didst not reveal this by any voice of angel nor sacred visions or apparitions to the sailors, but through mute testimony thou didst think good to reveal these things, and thou wast desirous to hinder them until they should place the relics together with the rest! (12) After this happened and the winds finally died down and the sea was calm, they left the shore and sailed to the harbor of Marcianus (Makri, ancient Telmessos) with joy and a fair breeze. When when they had crossed the Gulf of Trachea (Gulf of Symi? Between the Island of Symi southwards to Rhodes), one of the sailors whose name was Disigius thought that the saint had appeared to him in his sleep and said: "Be not disturbed in any event, for I shall be with you. Know then, that after the completion of twenty days we shall be together in the city of Bari." Disigius, rising from sleep, narrated what he had seen to his fellow sailors. And they, hearing this, were filled with unspeakable joy and disembarked on the island of Ceresanus (unknown: ed.). There, after taking supplies on board and drinking of the very excellent water that abounded in the place, and storing some on their ships, they sailed away and covered five hundred miles (all references to "miles" are Roman miles, 1680 yards: trans.) in two days and one night. Disembarking then on the island of Melos, they refreshed themselves there and at daybreak resumed their journey. (13) After this, I know not how, a portent was made manifest to them, as they afterwards narrated. For when they were at sea, a little gull came and perched on the starboard side, where the venerable remains reposed, and most gently and tamely, as thought it had been fostered by them, alighted on the hands of the captain Nicholas; and then flitting from his hands, it perched upon the venerable remains, and giving forth its lyric song, it caressed the remains tenderly. 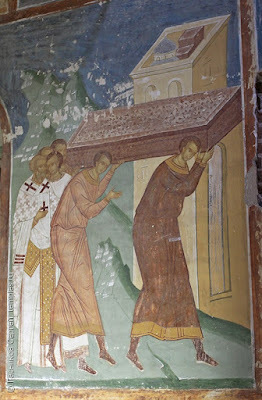 Ah, my beloved brothers, how great is the power and wisdom of our Christ which is manifested not only through the voices of men, but is also sung significantly by mute creatures and is rendered reverence by them, here mid the venerable remains of our holy Father Nicholas; for I in truth, its voice was a hymn and the approach of its beak was an obeisance! It then flew away, circling to each one of the ships, in the sight of all the sailors, and rendering them some blessing by its chirping, in that there was with them our thrice-­blessed and inspired Father. And thus, having rendered such service, it straightway flew away, never to be seen again by them. (14) Afterwards they disembarked on the island of Staphnos (Staphnu or Bonapolla; very probably the modern Kaimeni: ed.) and then on the island of Geraca. Sailing from there, they crossed the Monobasia (Modern Monemvasia "Epidaurus Limera": ed.) and they arrived at Methone (Modern Modon: ed. ), where they bought supplies, and from there they sped to the island of Sykia. After refreshing themselves there a while, they quickly set sail and -­ O the wonder of it, I am awestruck to tell of it ­- they did not land at any other place or replenish themselves in any way until they arrived at the divinely-guarded city of Bari itself! 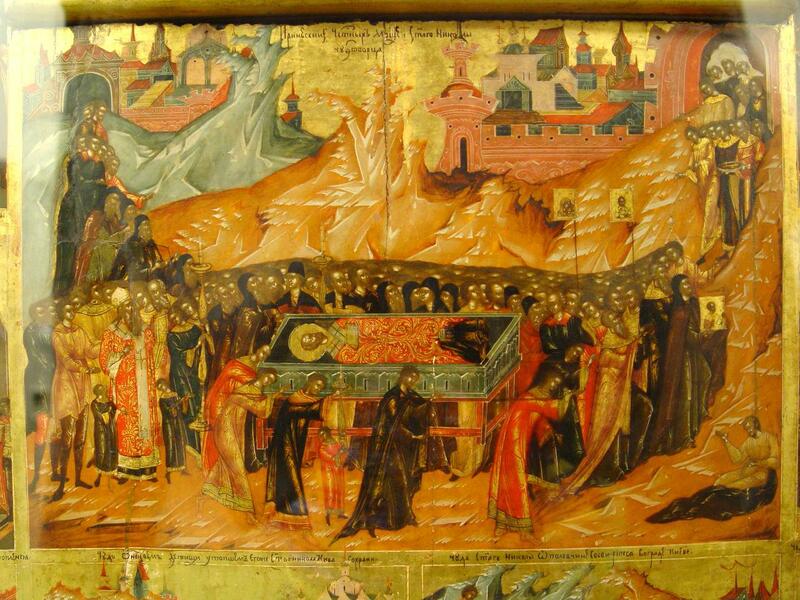 Then, arriving at the harbor of St. George the great martyr, about four miles from the city they set about to fashion a most beautiful casket in order to place therein the venerable remains. And this they did. 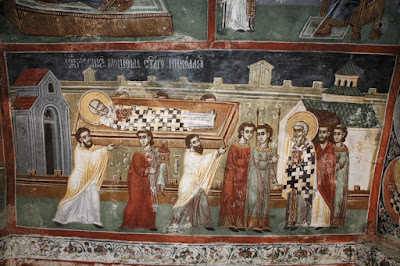 (15) And when they had come into the city harbor and had placed the sacred remains in the casket and were welcomed joyously bv the townsmen and their fellow citizens, they narrated to them how they had acquired the sacred remains of our holy father Saint Nicholas. And when those present had heard this and had announced the good tidings to the city, the inhabitants of Bari on hearing them ran with one accord to see the endless throng at the harbor on the occasion of such a welcome and unhoped for spectacle. And the sacred and holy ministers of the archdiocese and the clergy of the other churches, garbed in their holy vestments and singing a heavenly hymn, departed straightway for the harbor to receive the holy remains of the Blessed. Then those on the ships addressed their fellow citizens: "Let it be known to you, our brothers, that when we took the holy remains from Myra, we joined in a vow to build a magnificent altar for our holy Father, where the royal praetorium of our camp is. We ask you, therefore, to be in accord with us in the decision and promise which we have made." 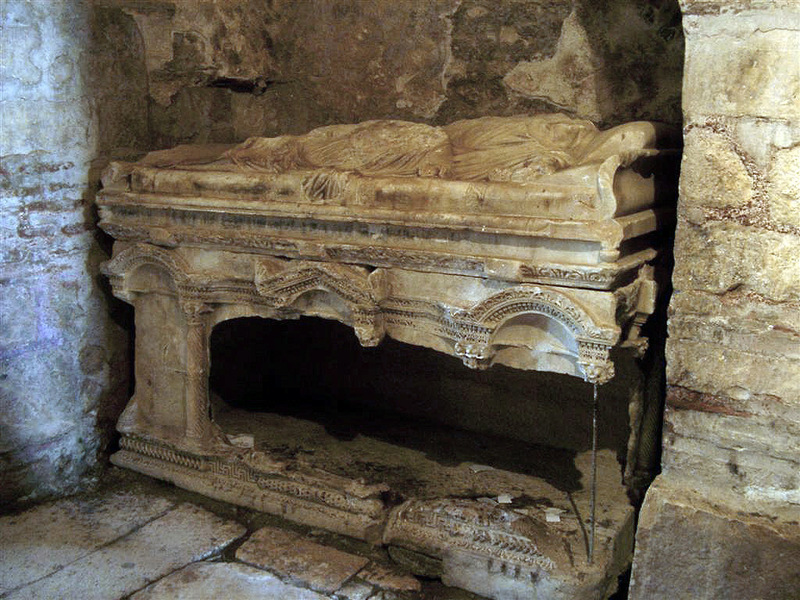 (16) And when the men of Bari heard this, some replied: "No, do not put him there, but place the remains in the Cathedral." But others said: "It is well to do this." While they were discussing the question with one another, the sailors bade Elias, abbot of the monastery of St. Benedict, to board their ships. And he did so and paid reverence to the holy remains, and said to the men on the ships: "Behold, as you see, I have come to you insisting that you give me the venerable remains, until the townspeople have reached an agreement, and then I will return them to you safe and sound." They all acceded to his request straightway. And then the most august heralds of the city proclaimed a hymn in honor of the saint most fitting for the occasion and harmonious. 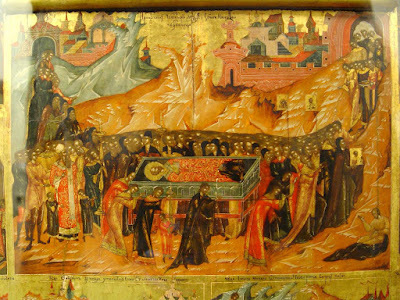 And carrying the casket from the ships, they placed it within the altar of St. Benedict, while the sailors carefully guarded the monastery gates lest they be deprived of the holy relics by some stratagem. (17) And immediately word was sent to the Archbishop Ursus who at that time governed the See of Bari, to come with haste. For several days previous he had been in the camp at Canusium (modern Canosa: ed.). But nevertheless, when he was informed and heard the story, he went to Bari with all speed, praising the Lord for what had happened. Then, entering the city, he went straight to the holy and sacred remains, both to pay them homage, and also to take possession of them with all zeal. And when the sailors and the townsmen had learned this, they rushed with one accord to defend the holy remains. And the Archbishop, therefore, when he had heard them, was vexed and did not know what to do. And the men of Bari, as was fitting, sent prudent and wise men to him, saying: "Do not do this, Father but rather make haste to fulfill the will of your spiritual children." But he not being moved to assent to their words, but have devised and expedited a vicious scheme with his cohorts, planned to carry off the venerable remains by force. And when the ambassadors returned with empty hands and had made clear to all the archbishop's plan, they seized arms and began to sound the war cry. In the fighting that ensued there fell two of the archbishop's men and one of the townspeople, whose souls entered the halls of the just. (18) The large crowd of citizens immediately bore off the venerable remains from the monastery of St. Benedict, singing "Kyrie eleison" and other suitable and sacred hymns. And taking the remains from the gate of the harbor, they brought them to the royal praetorium and placed them in the altar of St. Eustratius the great martyr. 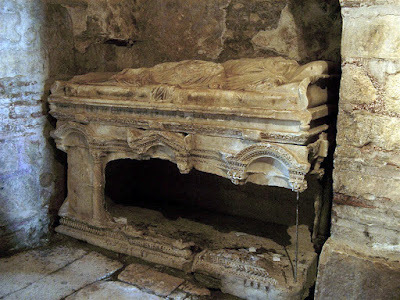 And this altar, together with other sacred altars that were in the praetorium, was razed to the ground, in order to erect there the holy and sacred altar of our inspired Father Nicholas, while the aforementioned leader addressed them: "The holy archbishop Nicholas himself must be guarded by all these sacred churches in our whole city. And lest anyone rob his holy remains, let them be guarded carefully by us under arms, until his venerable and sacred altar be finished." (19) Be it known therefore that St. Nicholas was translated from Myra in Lycia eleven days before the Kalends of May and entered Bari on May 9 at the first evening of watch. (20) Now I should like to tell you, beloved, how the folk, running from the four corners of the city, gathered in his church, suffering from various sicknesses. And there were cured that night and the following morning forty­seven men, women and children. And one of these was called Adralestus a man of noble and prominent family of the city of Bari, a victim of a terrible disease; and another was Armenius who was lame on his left side; and there were three epileptics, one deaf-mute, two with crippled arms, two lepers, three paralytics: there was also a certain Pisanus whose hands and feet were distorted. And many others were cured of whom I cannot give a detailed account. On the third day the people came in droves from all the environs to honor the sacred remains, as we have said. Among them seven men were cured up until the fourth watch of the day. And from the fourth watch till sunset fourteen others were cured. And on the fourth day twenty-nine others who were suffering dreadfully were cured. And not only those who suffered bodily ills obtained their health, but very many others who enjoyed bodily integrity, received conversion and salvation of soul, of whom I am unable to give a written account. (21) And on the fifth day our loyal patron Nicholas appeared in a vision to a certain monk whose name was Mark, of the monastery of Celius, bidding him to go to Bari and tell the people not to lose heart concerning the occurrence of miracles, "For by the will of God I am leaving the Roman world; but whither I go. I go on a visit, but here I shall dwell forever". But as another proof that they might know, the following event occurred. Before sunrise that day a man was cured who was tormented by an evil and deaf and dumb spirit! On the sixth day the Archbishop of Bari with four other Bishops of neighboring cities, together with their retinues of clergy and lay and a huge throng all came to reverence the saint, amid psalms and hymns and spiritual songs, justly honoring him who was honored and glorified by the Holy Trinity, and who in their last trials restores as citizens of heaven and equals of angels his servants and ministers. (22) And we, after plaiting a crown of praises for the saint, shall bring this discourse to an end. Hail, O loyal patron and intercessor for Christians! Hail, protector in perils and surest succor of sailors! Hail! helper of those who invoke thee and provider of those who importune thee for favors! Hail, peer of angels and companion of the holy archbishops. Hail, shield of orphans and provider of widows! Hail, O thou, who of old didst render fragrant Myra with the blossoms of thy miracles, and dost now adorn Bari with the brilliant gleams of thy wonders! Hail, O thou who hast enriched the land of Italy with thy lightning flashes and dispellest the gloom of sickness and possession with the brightness of thy prodigies! Hail, and truly hail, since thou art the champion most loyal in trust and the most speedy intercessor of all who call on thee! Since thou hast access to the holy and divine Trinity, deign to guide us in the way of virtue, and protecting us unscathed and unharmed from the darts and snares of the enemy and overthrowing all the arrogance and the overweening fraud of our visible enemies, may thou grant us to accomplish this life without deception, leading us to that most happy life hereafter, where the jubilant dwell in Christ Jesus our Lord. Wherefore to Him be all glory, honor, adoration with His eternal Father and the all-­holy, good and vivifying Spirit, now and forever. Amen.